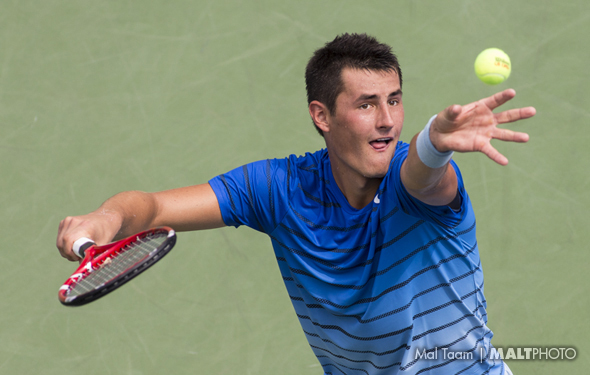 Given that Bernard Tomic has been struggling mentally with the Aussie Open bosses, but he did concentrate a great deal and he upended Marin Cilic 6-3 6-4. Interestingly, not only has the former two-time champ Lleyton Hewitt is now helping Nick Kyrgios, but he has hit with Tomic this year. Tomic has said that he really respects Hewitt, so perhaps he will be helping with both of them? Tomic could really use his council. The US Open champ Cilic looked pretty decent in Washington, but in order to have a chance in NYC, he is going to have to be much more consistent. How about the Belgian David Goffin blew out Steve Johnson and then he was comfortable when he beat Sam Querrey 6-4 6-4? Does Goffin really have the goods on hard courts? It’s time. Gael Monfils was saying that he was very happy to be back on North America, but then he went down against Gilles Muller, losing 6-3 3-6 7-6(4). Monfils believes he can really go far at the USO and maybe he can, but he needs to push hard at the Cincy so he is feeling very comfortable. Jack Sock grabbed a marathon in the first round, and then he out lasts Grigor Dimitrov 5-7 7-6(5) 7-5. The 22 year old has improved a lot this year, but while he has shown that he can reach the top 10 next year, is he ready to shock No. 1 Novak Djokovic? He will have to play his best match ever. Here is a surprise of the day: the so-called “veteran” Donald Young upset Tomas Berdych 7-6(5) 6-3. The newly wed Berdych is still on his honeymoon, or has Young realized that if he does not play aggressive all the time that he won’t ever reach the top-20. Victoria Azarenka and Petra Kvitova hadn’t played since 2011, when Azarenka had grabbed their first two contests. The Czech won four wins in a row, their last meeting in October in Istanbul at the WTA Final, with Kvitova out-hitting Azarenka in a tremendous contest. For whatever reason, they kept missing each other. They are around the same age, and both have won two majors (two Aussies for Azarenka and two Wimbledon for Kvitova). They have changed quite a bit since then, but on Wednesday night, it was hard to tell who was doing what. Azarenka, who has been struggling with her serve during the past year and half, looked terrific, while Kvitova looked pretty slow and erratic. Azarenka won the match 6-3 6-2.
that she isn’t close to 100 percent. If Kvitova won the US Open, it would be a miracle. Azarenka has played fairly well at times this year, but she has not been consistent. Maybe her door will soon come open. Credit to Belinda Bencic, who beat Genie Bouchard in three sets on Tuesday night and then late in the afternoon on Wednesday, she knocked Caroline Wozniacki 7-5 7-5. The 18-year-old Bencic is improving day after day and without a doubt, if she keeps her head on straight, she could reach the top 8 by the end of the year and be able to play at the WTA Finals in Singapore. She would be thrilled. Wozniacki is slightly hurt, she lost in her first match in Stanford and now she did the same thing in Rogers Cup. She said last week that she has a chance to win the US Open. Really? Well if she has any chance she has to turn it around very quickly. A number of the young players went out immediately, such as Sloane Stephens and Elina Svitolina on Tuesday, and on Wednesday, the Wimbledon finalist Garbine Muguruza lost to Lesia Tsurenko 7-5, 6-1. Maybe the Spaniard will wake up immediately and compete in Cincy. If she wants to be a great player, she has to lock in every single time. Sabine Lisicki looked extremely forceful in beating Venus Williams on Monday, and then she overcame Barbora Strycova 7-6(3) 6-4. The big-server Lisicki will face Bencic, who attacks every moment. Angie Kerber has won seven matches in a row and now she will face Simona Halep, who is back after a long rest. Halep hasn’t played very well in the past couple months, but she is happy to be back on the hard courts. Plus, Kerber has to be tired. However, the German is more confident now and she will fight her to the end. Here was a good one when Daria Gavrilova stunned Lucie Safarova 4-6 7-5 7-5. The 5-foot-5 Russian-Australian hustles around all the time.